A native iOS or Android application development for your business is an ideal planned decision to capture the online payment market. 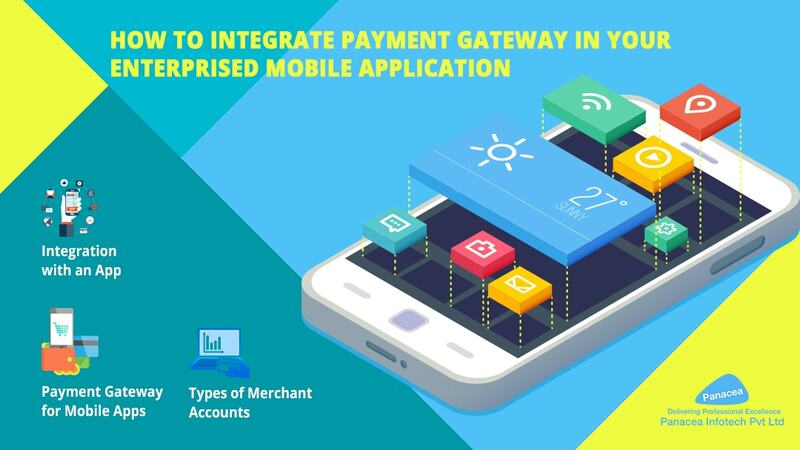 But before developing an enterprise mobile app, you need to understand how payment gateway integration in iOS and Android works. To know more about integration, you need to first decide the payment gateway. In real life, the example of a payment gateway is a point-of-sale machine, or POS (Point of Sale), which could be easily found in any retail store. You might have heard thousands of times the phrases like: ‘Sorry, your card was declined…’ in case your payment was not approved and ‘Here is your check, please…’ in case your payment was successful. What happens? The POS sends the credit/debit card information to its issuer to validate if the owner has enough money when you do a shopping. In other words, POS acts as a middleman between a client and a financial enterprise. If a customer wants his/her payment to reach its destination that is in a seller’s account, seamlessly, then the second person needs to select a valid payment gateway. The same should be done to our prospect ecommerce application. It seems to be easy to follow the similar logic in the case with a mobile app, actually, the situation is a little bit different. What you require to have as an owner of a bricks-and-mortar store are a payment gateway and an account of the merchant. If a mobile application is being developed, the situation is almost the same. In fact, it is essential to have this account in both cases as this is where your money is held before they will be moved to your actual bank account. What is about an application? The mechanism of the payment process is as follows: a user chooses some products in your app, if they wish to buy them then they are moved to a cart. This cart holds up with a payment gateway, which performs the exact function as a POS in a retail store. What is next? The request is then sent to a card processor, once your payment is approved, the detailed information goes from the gateway to the merchant account, here it’s stored for several days until it is sent to a merchant’s bank (your actual one). The first type is set up just for you individually, and, of course, it is built for the additional money. The total amount of money depends on a provider. Having the committed merchant account means more control over your money. But it has a drawback: the accession/acquisition process can take a lot of time and you will need to provide a detailed and lengthy formation about you and your company affairs. Then you will require to go through an extensive credit check and so on. Authorize.net and PayLeap are good examples of companies that provide the dedicated accounts together with additional services (these are usually included in a package for free). If you select an aggregate account, it means that your funds are in one bunch with other money of merchant. Payment gateway services like PayPal, Braintree, and Stripe give the opportunity to get the aggregate merchant’s account. You still need to provide some information about your company and products to be sold. However, the acquisition process is not that complex and you can get your account sooner. And the last but the most interesting part- integration. As we mentioned earlier, every provider offers a developer SDKs. These include robust mobile libraries that make your job easier since credit cards data are processed by them. It means that mobile app development company needs to make less effort for implementation and not that vulnerable to PCI compliance. You can find these developer kits on official payment gateways sites. Utilizing them, you can build payment forms for users’ data collection. Stripe, for instance, provides two options: you can either use their pre-built form component or build your own from scratch. That is good as you have full command over UX since you have an opportunity not to use predefined widgets. If it comes to the payment gateway in iOS, the best part of providers work with Apple these days. With this feature, iOS users can seamlessly pay with one touch inside a mobile application using a credit card data stored before in their Apple Accounts. If you need extensive business startup solutions, feel free to contact Panacea Infotech. Our team of expert developers helps you to develop robust mobile applications and website to grow your business successfully in the competitive marketplace.